Here’s an extremely interesting relic from 1960s Czechoslovak cinema: Ninety Degrees in the Shade (Třicet jedna ve stínu) is a 1965 Czechoslovak-British co-production that was shot on location in Prague, and starred iconic Czech actor Rudolf Hrušínský alongside a quartet of top UK thespians. Directed by Jiří Weiss, best known for his films Romeo, Julie a tma (Romeo, Juliet, and Darkness) and Vlčí jáma (The Wolf Trap), Ninety Degrees brought top UK actors James Booth (who starred in Zulu the year before), Anne Heywood (The Fox), Donald Wolfit (Lawrence of Arabia, Beckett), and Ann Todd (Hitchcock’s The Paradine Case) to Prague for location filming on its story. 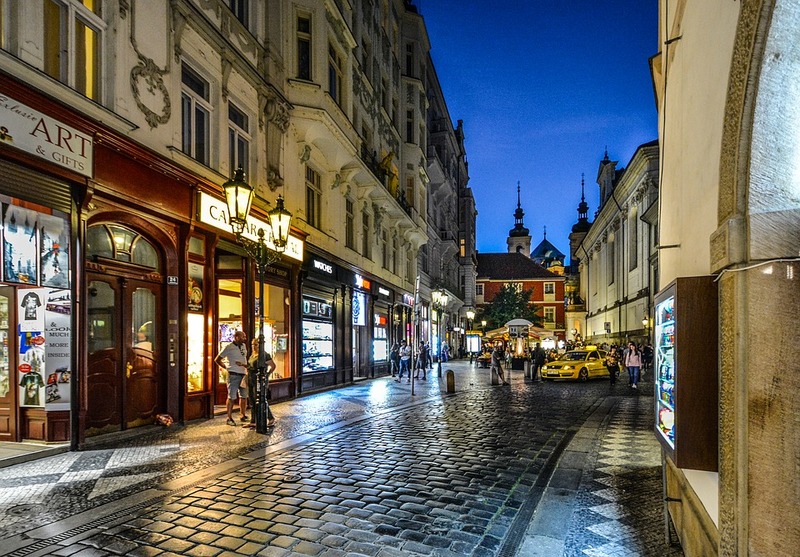 That story, from a screenplay credited to David Mercer (Morgan!, Family Life): the four UK thesps portray employees at a Prague convenience store (potraviny), where an auditor played by Hrušínský comes to investigate and take inventory. The plot in Ninety Degrees in the Shade makes for a fascinating comparison with more lurid British and American crime thrillers of the time. In communist Czechoslovakia, the central misdeed is not murder but something far more common: booze embezzlement, with bottles of expensive (and non-selling) Cognac filled with tea and their contents presumably sold on the side. Booth’s married man, Vorel, is behind the crime, with assistance from mistress and colleague Alena (Heywood). But while the stakes here seem to be incredibly low, the consequences are unexpectedly devastating. Ninety Degrees in the Shade was introduced to audiences at this year’s Noir Film Festival in Krivoklat by assistant director Hynek Bočan, who would later direct the beloved fairy tale S čerty nejsou žerty (Give the Devil His Due). Bočan described a competition over acting styles on the set, with the classically trained British thespians clashing with Hrušínský’s more natural method style. But ultimately, Bočan recalled, there was no doubt who was the best once the cameras started rolling, with Hrušínský doing the Czech crew proud. And while I caught the Czech version of the film at the Noir Film Fest with the British actors overdubbed (an English-language version was released in the UK), Hrušínský's inspector does come to dominate the movie, particularly in third-act scenes where he takes center stage. It’s one of his quieter, more subtle performances, and unexpectedly affecting. Heywood and (particularly) Booth are also quite good here as the shopkeepers struggling with their conscience; Wolfit and Todd have relatively little to do, but offer solid support in minor roles. Cinematography by Bedřich Baťka is wonderfully high-contrast, with the footage of Prague nights awash in deep, inky blacks; Luděk Hulan’s smooth jazzy soundtrack well-suited to the material. While there doesn’t seem to be much happening on the surface of Ninety Degrees in the Shade, there’s so much bubbling beneath the surface. As a comparison between Western and Eastern (at the time) concepts and styles in film noir, bolstered by the choice of actors, this is an extremely interesting curio. Note for Prague watchers: opening scenes feature some great footage of Prague’s public swimming pools on the Vltava at Občanská plovárna, which were devastated by the 2002 floods and no longer exist.